Shane Tutmarc was born in 1981 near Seattle into a family of musical pioneers, heir to a musical gift passed through generations. His great grandfather built the world’s first electric guitar, his great grandmother was the first electric bass player, and his grandfather is world-renowned Hawaiian steel guitarist Bud Tutmarc. But even bloodline cannot account for the music that flows so readily out of the soul of Shane Tutmarc. Having been a dearest friend, fellow musician and immense Dolour fan for as long as we have known each other, it is clear to me that his music comes from somewhere else – a place Brian Wilson would call “The Source”. Shane’s lifelong devotion to songwriting, his relentless quest for the perfect song, is incomparable to anything I have encountered. He is surely the most prolific songwriter I can name. Often it seems to those around him that Shane’s life is sustained and nourished by music and music alone. Shane has played an enormous role in shaping my own musical journey since we met in 2000 at a party where my band Wonderful was playing our first show. We were immediately bonded through our mutual love for the songs of Beach Boy Brian Wilson. Soon thereafter, Shane moved into the house where we were living and continued to write songs relentlessly, as he had been doing for years already. In the spring and summer of 2002, through a series of party jams with friends, we unwittingly began a new project together, United State of Electronica (U.S.E). After collaborating on an albums’ worth of songs as the bass player of U.S.E that summer, Shane once again fully devoted himself to Dolour. Since 2002 he has written, recorded, and produced four brilliant albums (with another currently in the works), only one of which has ever been released to the public. He has also in that time produced and arranged several albums by other artists including Ian McGlynn and Sameer Shukla. 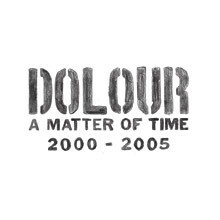 “A Matter of Time: 2000-2005″ is a mere taste of all that the world of Dolour has to offer. Tracks were selected from various records Dolour has created since 2000, including Waiting for a World War, Suburbiac, “Pieces”, and New Old Friends. For each song on this album there is virtually another entire record’s worth of songs of equal caliber within the Dolour archive. But for a songwriter that pumps out your favorite new song on what seems to be a daily basis, we must start somewhere, and this collection of songs provides an excellent overview of Dolour’s musical progression throughout recent years.